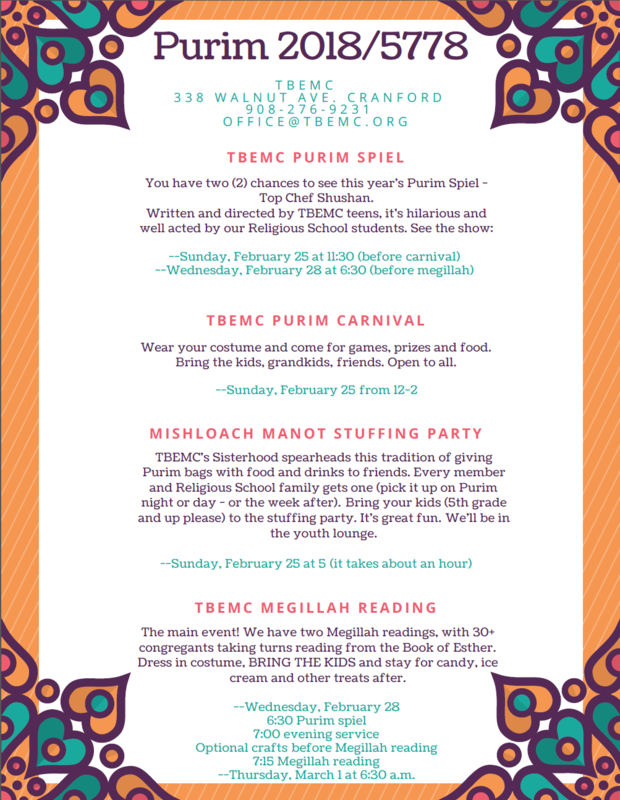 Purim Carnival, Sun., Feb. 25th, Noon to 2 P.M. Religious School Ice Cream Social and Open House, Tue., Aug. 8th from 6 P.M. to 8 P.M.
TBEMC teens on hand for crafts & games! Bring your friends … make new ones! With Rabbi David Klatzker, Ph.D.
Drop your kids off at Religious School or come for the 9:00 am service, run errands, then join us for Cantor Frank’s famous coffee and an opportunity to meet other parents and discuss Jewish “mindfulness” practices in relation to parenting. We will study “Mussar”—Jewish values and concepts to enhance our parenting practices and our relationships with our children. Examples of the character traits we will discuss: Patience, humility, respect, order, trust, equanimity, lovingkindness. A different trait every week, so don’t worry if you have to miss a week. No Jewish educational background is assumed. All are welcome. There is no charge. RSVP to office@tbemc.org by November 4. Religious School Movie Night: “Keeping Up With the Steins” Sat., Dec. 3rd at 7 P.M.
Join us for the Religious School movie night at TBEMC! We will watch this hilarious movie, which deals with many issues related to the process of becoming Bar/Bat Mitzvah. Popcorn and snacks. All ages are welcome. Celebrate the start of a new school year with old friends and new with our annual picnic on the first day of Religious School. This is a great chance for the kids to play with their classmates and for parents to connect with each other. We’d especially like to welcome families new to the religious school and those considering joining! Please bring Frisbees, stomp-rockets, balls, etc. When: Sunday, September 11, 2016 at 12:15 pm – the end of the first day of Religious School. Rain cancels the event. Bring: your own sandwiches. We’ll share kosher (dairy) side dishes and desserts. Come One, Come All to the TBEMC Religious School Picnic! Celebrate the end of a school year with old friends and new. This is a great chance for the kids to play with their classmates and for parents to continue getting to know each other. We’d especially like to welcome families in their first year at the religious school! Please bring Frisbees, stomp-rockets, balls, bubbles, jump ropes, etc. Bring: your own entrée. We’ll share vegetarian kosher side dishes and desserts. Paper goods provided. On Friday June 3, we will host our final special family shabbat service with a dinner to follow. We will be celebrating our 6th and 7th grade students, who are invited to lead parts of the service. However, in the spirit of communal celebration, all of our TBEMC Religious School families are invited to join us for this final special Shabbat dinner which will be held immediately following services. .
Sandy Wilson in the main office will assist us with taking RSVP’s. Our kosher catered food will be provided by Deli King of Clark. We hope you consider joining us for this last special Shabbat family dinner of the year. As with previous dinners, the cost is $18/parents, $9/children. Payment due in advance of the dinner or you will be billed from the Temple. Pay electronically below. Please let Sandy office@tbemc.org know if you need any special dietary needs accommodated. 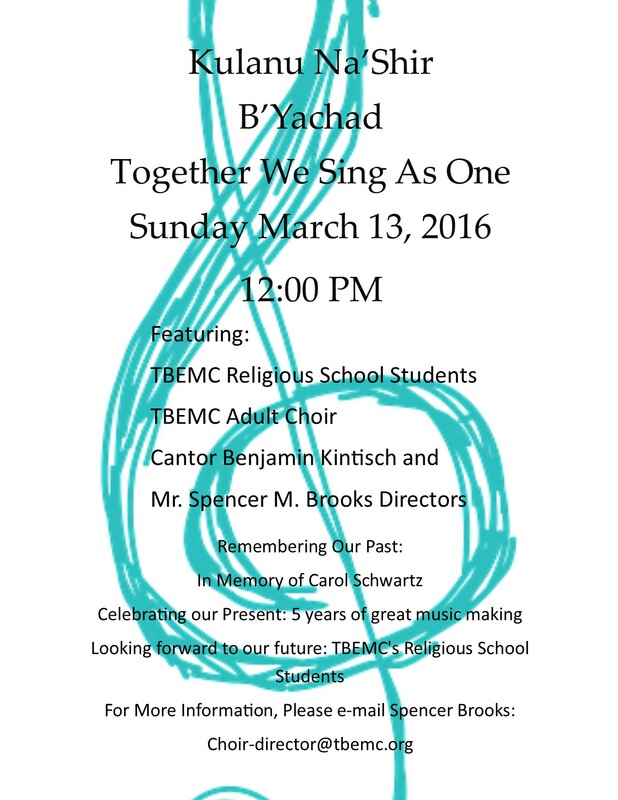 Kulanu Na’Shir B’Yachad: Together We Sing As One, Sun., Mar. 13th at Noon. $10/adult.